BEECHEY, Frederick William. 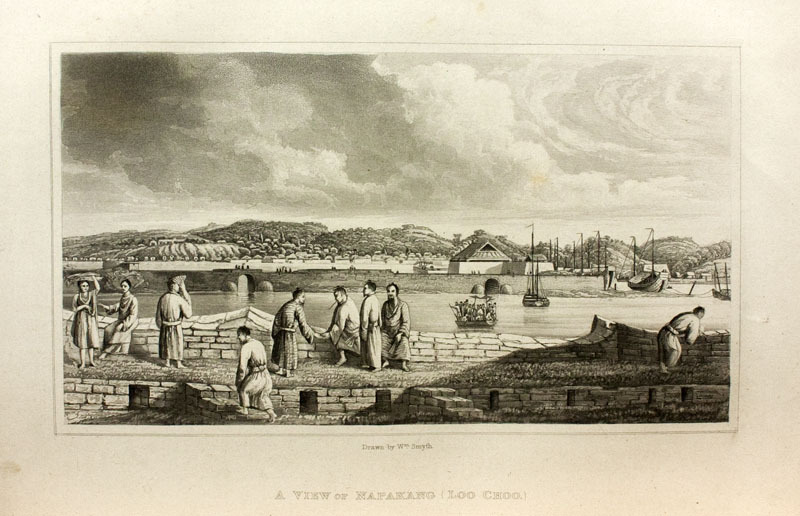 Narrative of a Voyage to the Pacific and Beering's Strait... Performed in His Majesty's Ship Blossom...in the Years 1825, 26, 27, 28... London: Henry Colburn and Richard Bentley , 1831. First edition. 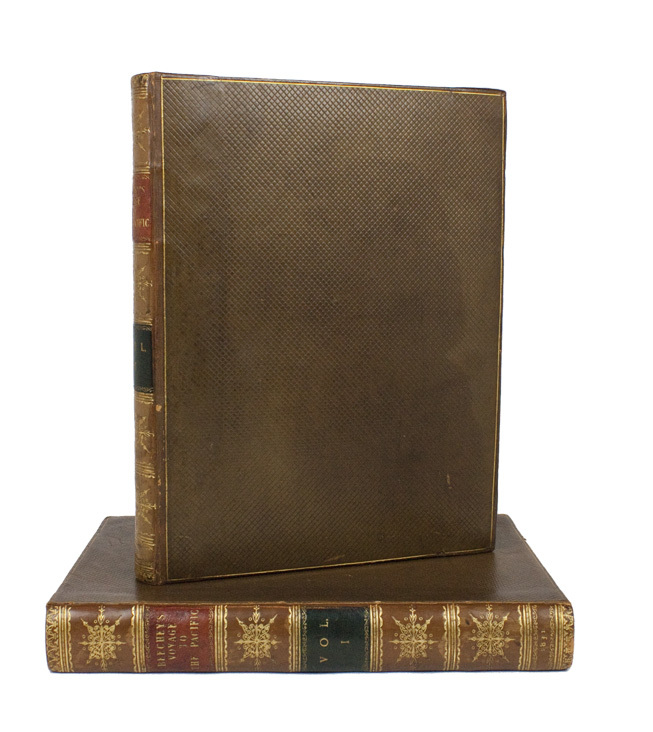 Two quarto volumes (10 3/4 x 8 3/8 inches; 273 x 212 mm), [not to be confused with the octavo edition of the same year]. [iii]-xxi, [1, errata], [1, directions to the binder], [1, blank], 392; [iii]-vii, [1, directions to the binder], -742 pp. Bound without the publisher’s advertisements ( pp.) at the end of Volume II, and bound without half-titles. Three engraved maps, two of which are folding, and twenty-three engraved plates. Contemporary diced calf, rebacked to style. Boards ruled in gilt. Each volume with red and black spine labels. Spines stamped and lettered in gilt. Board edges stamped in gilt. All edges marbled. The Frank S. Streeter copy with his bookplate on front pastedown of both volumes. A bit of spotting and offsetting. Front hinge of volume I professionally repaired. A 3/4-inch closed tear to outer margin of b4 in volume I, not affecting text. Boards with a few light scrapes and spots. Overall a very good, handsome set. Housed together in a slipcase. “Beechey’s assignment was primarily to meet Captain Perry and Sir John Franklin on the west shore of Bering Strait and bring home one or both of them. They were searching for a Northwest Passage north of the Arctic Circle. 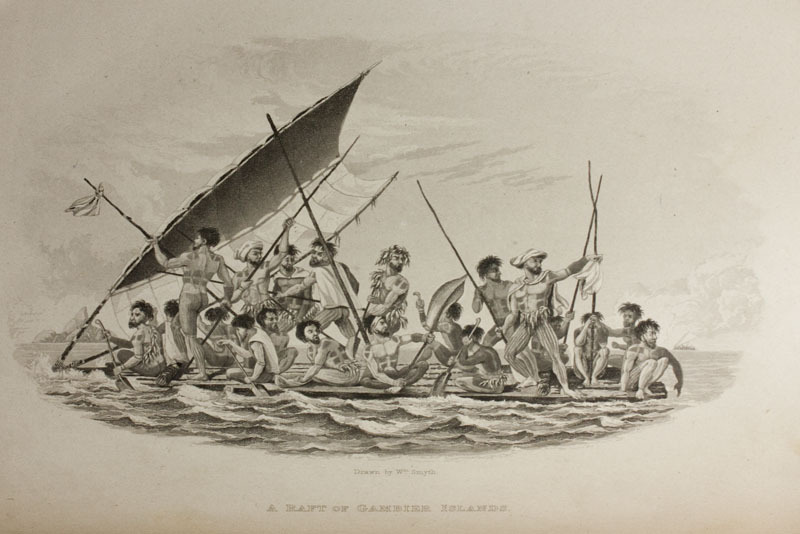 However, before reaching Bering Strait, Beechey was to go to Rio de Janeiro, around Cape Horn, and call at Easter Island, Tahiti, and Pitcairn Island. 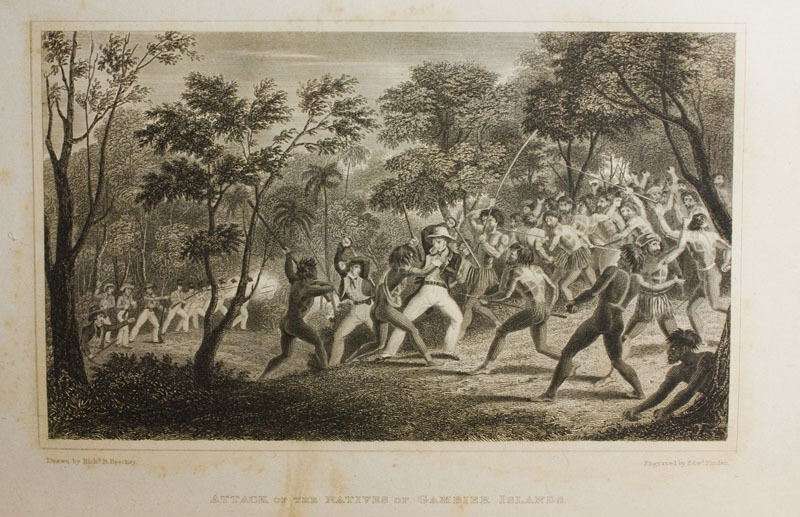 Chapters II and III contain the story of the mutiny on the Bounty, as related by James Adams, the surviving mutineer; also the description of the Blossom’s, Captain Beechey’s ship, stay at Pitcairn Island” (Lada-Mocarski). 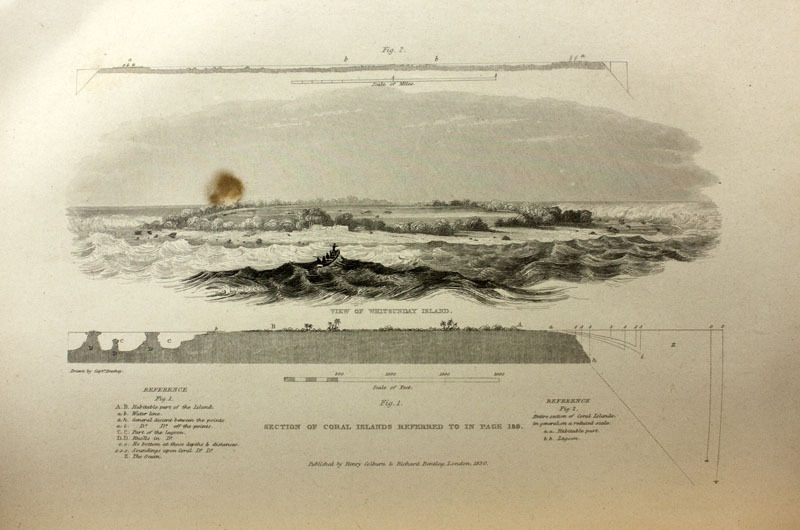 “Captain Beechey [1796-1856], near Point Barrow, Alaska, and Sir John Franklin had arrived within fifty leagues of each other when the latter was compelled by weather to return. 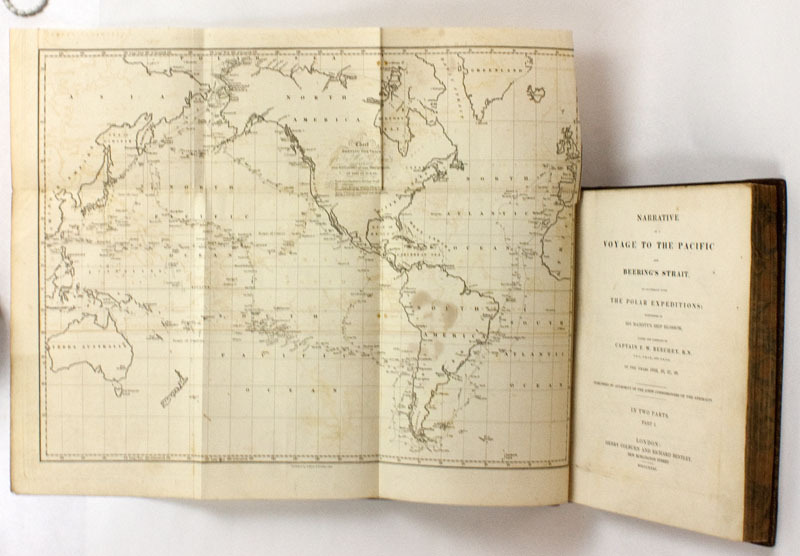 Beechey’s book is one of the most valuable of modern voyages and relates to extensive visits to Pitcairn Island, the Tuamotu Archipelago, the Society Islands and Tahiti, Alaska, Hawaii, Macao, Okinawa, and the coast of California. His book provides an important account of Monterey and San Francisco before the American conquest and gives his impressions of the missionaries in San Francisco. Beechey describes the Eskimos of the north and relates his meeting with John Adams, last survivor of the mutiny on the Bounty, who gave Beechey a lengthy account. 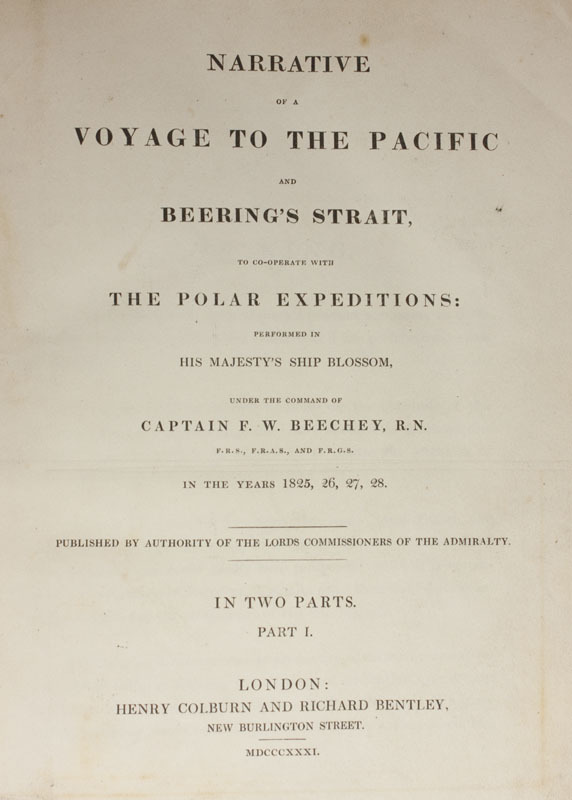 In the course of this voyage, Beechey discovered several islands in the Pacific” (Hill). “Beechey arrived in San Francisco on November 7, 1826. 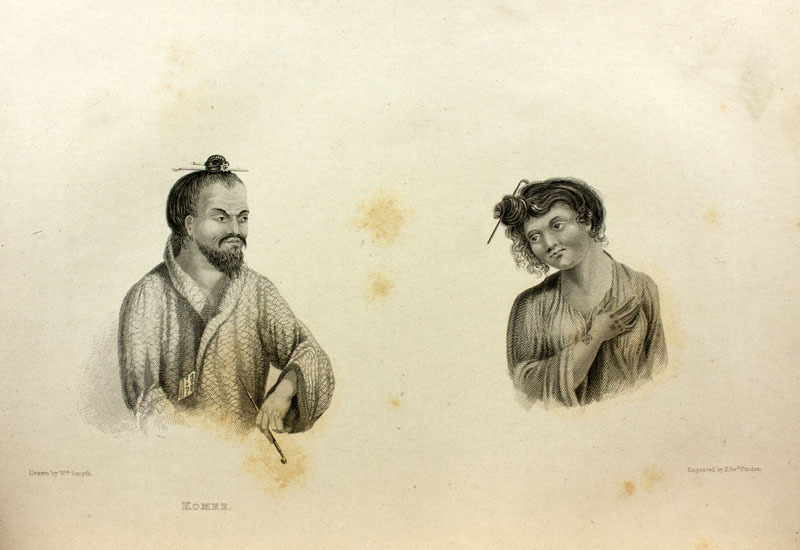 He remained about a month in California, returning in 1827 for another month’s stay. He gives a description of San Francisco harbor and tells of the sad state of affairs of both mission and presidio. He claimed that the soldiers and clergy were dissatisfied with conditions in California (the pay of the garrison was many years in arrears). He described the treatment of mission Indians and the hunting of the wild ones, the latter’s mode of life as taken from the journals of Spanish officers. He also visited Monterey. Beechey remarked about meeting a gentleman belonging to the American Fur Company. ‘One of the depots, we are informed by a gentleman belonging to the establishment, whom we met at Monterey in 1827, is situated on the western side of the Rocky mountains on a fork of a stream of the Columbia called Lewis river, near the source of a stream supposed to be the Colorado.’ Could this have been Jedediah Smith? He was at Monterey and San Francisco during Beechey’s stay. On November 22, 1827, due to pressing business, he declined an invitation to dine on board the Blossom. One plate related to California, showing Californians throwing the lasso” (Zamorano Eighty). Cowan, p. 42. Ferguson, Australia, 1418. Hill I, p. 19. Howes B309. Lada-Mocarski 95. Sabin 4347. Zamorano Eighty 4.